The final week of fantasy football draft season is coming to a close and maximizing value is crucial as your draft unwinds. A single “reach” pick can derail a draft leaving owners scrambling to put together a viable roster. Don’t be that person in your draft. After examining the top value picks for the AFC on Wednesday, today we will now look at the top value picks for each team in the NFC. This doesn’t mean a sleeper, necessarily — it’s just which player offers the best value. If that’s a first-rounder, it’s a first-rounder. The converted wide receiver didn’t hit the field until Week 11 last season but still managed to score three touchdowns and averaged a hefty 16.8 yards per catch. He currently sits atop the Cardinals depth chart at TE and is poised for a breakout season. Currently being drafted as a TE3, Jones has the potential to be the steal of the 2018 fantasy draft season. We’ll keep this one short and sweet. Anytime you can get the third-ranked WR according to PFF and perennial top-12 PPR scorer in the second round … you do it. The Panthers didn’t draft Moore in the first round to let him sit, and it won’t be long before he’s starting opposite Devin Funchess. Offensive coordinator Norv Turner will find ways to get the speedy rookie the ball and he’s currently a 10th-round selection. The speedy rookie made a big impact in PPR formats despite playing just 360 snaps last season. Cohen finished with 728 total yards with three touchdowns, which landed him just outside RB2 totals in PPR. New head coach Matt Nagy will be moving Cohen all over the offense to get him the ball and he definitely deserves to higher than the 33rd RB off the board. This was the toughest team to really find value for outside of the obvious drafting of Ezekiel Elliott in the top of the first round. Somebody has to catch the ball for the Cowboys, and Gallup has put up a score in the preseason while averaging 15 yards per catch. With the lack of receiving options Gallup could become Dak Prescott’s go-to guy and can be had in the 12th round. It’s more than a little surprising that Jones is currently being selected as a high-end WR3 (26th). In 2017 he finished as a WR1 in both standard and PPR scoring, by far his best fantasy season. Jones has seen triple-digit targets in each of his two seasons in Detroit and will do so again in 2018, bringing huge upside. Locked in as the third-down and no-huddle back for Green Bay Montgomery is being drafted 50th at the position, behind both Jamaal Williams and Aaron Jones (who will start the season serving a suspension). Like division rival Cohen, Montgomery is basically a WR with a RB designation. As long as the recent foot injury is not a major one Montgomery is a great value. In his rookie season Kupp developed a rapport with Jared Goff, putting up 62 receptions and five touchdowns and averaging six targets per game. The addition of Brandin Cooks to the receiving corps should open up more space for Kupp and more fantasy production. He’s a great seventh-round value with high-end WR2 upside. It appears the Vikings may take it slow and easy in bringing Dalvin Cook back from his knee injury. Murray will have a bigger role than many expected, making him a nice 13th-round value pick. Let’s not forget that in Weeks 8-17 last season Murray put up top-15 RB totals. It feels like folks are overreacting a bit to the four-game suspension Ingram will serve as he’s currently the 25th RB being selected. 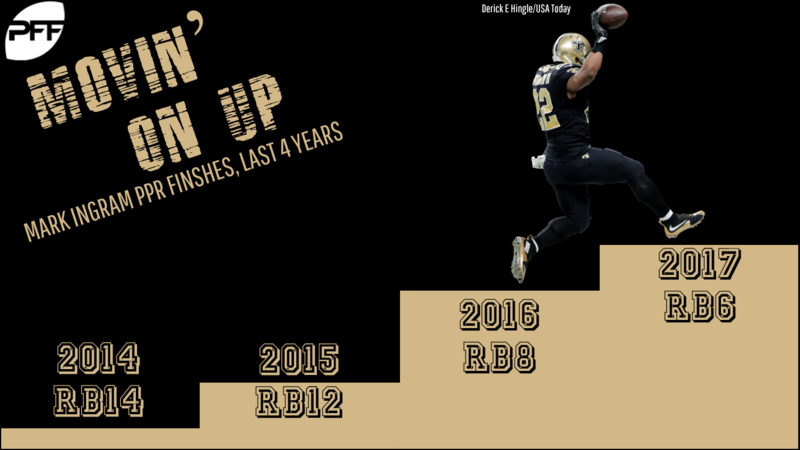 Ingram is coming off a top-10 fantasy finish after setting career highs across the board in 2017. The Saints will not turn away from the veteran when he returns and once again he’ll team with Alvin Kamara putting up big fantasy production. It doesn’t hurt that Ingram is in a contract season either. Stay with me here and trust that I have not begun to day drink while writing. Manning is just two years removed from back-to-back top-10 fantasy finishes and has a plethora of offensive weapons. A healthy (and wealthy) Odell Beckham Jr. immediately increases Manning’s value, as does the pass-catching ability of rookie Saquon Barkley and talented tight end Evan Engram. All three are ranked in the top 10 at their positions by PFF and Manning is currently being drafted as a low-end QB2 (24th off the board). After a decent regular season that saw him average 5.2 yards per touch (74 carries, 10 receptions) while scoring six times, Clement had a coming-out party in the Eagles Super Bowl victory. Clement totaled 108 yards on seven touches while adding a score. He’s the primary back up to Jay Ajayi and likely the passing-down back over Darren Sproles. Clement is a steal at his current 12th-round draft position. Once Jimmy Garoppolo took over at QB for the 49ers it became apparent that Goodwin was his go-to guy. Weeks 13-17, Goodwin put up top-10 fantasy numbers in PPR scoring and had two games with 100-plus yards receiving. Goodwin is currently the 30th receiver off the board and a great sixth-round selection. It boggles the mind that the lead back for Seattle — which Carson clearly is — has a ninth-round ADP currently. 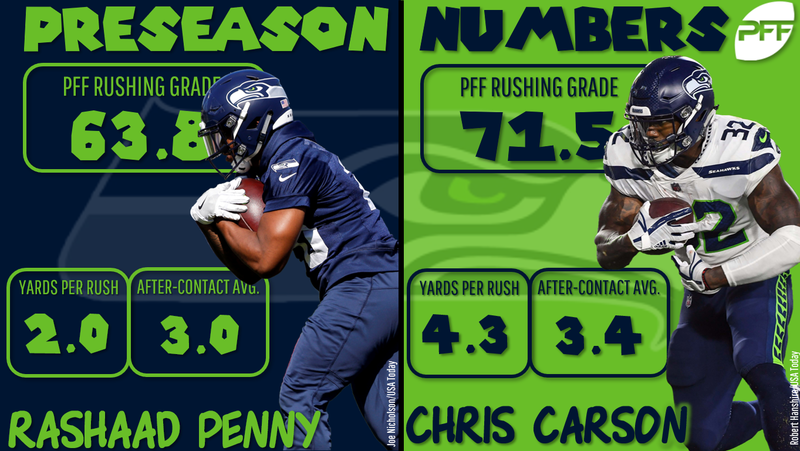 Rookie Rashaad Penny has gained 16 pounds since the combine (that feels like a bit much) and is dealing with a broken finger but somehow is still going off the board three rounds higher than Carson. Give me the lead back in the ninth round all day. It’s always a good thing to be able to draft a team’s lead back in the 10th round, which is where Barber is currently being selected. Barber has looked great in the preseason averaging 5.8 yards per carry and putting up a pair of touchdowns. Filling in as the starter last season Barber averaged 83 total yards per game in Weeks 13-17 and proved capable in passing game hauling in 12 passes. The signing of Adrian Peterson will not diminish the value of Thompson as the primary pass-catching option of the backfield. Thompson is on track to return from the broken leg that ended his 2017 season and be ready for Week 1. Through the 11 games he played last season, Thompson was putting up top-10 PPR numbers and is currently being drafted in the eighth round.